Full of twists and turns, Créme De Menthe kept fans on the edge of their seats. The episode picks up where we left off, continuing Claire’s struggle with the unknown attacker who she nearly kills and then tries to rescue. 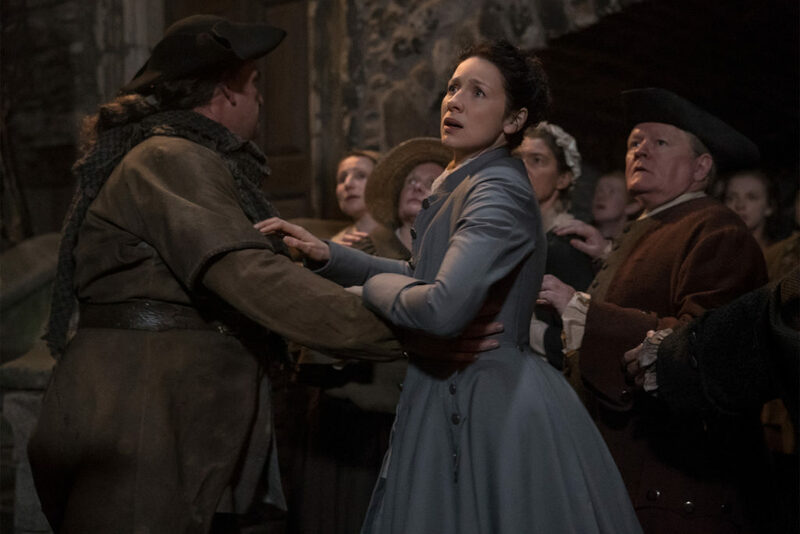 Going against every request of her husband Jamie, Claire leaves in search of equipment and medicinal aides she will need to help keep this man alive. However, she’s unable to do so. But upon discovery of this man and his allegiances, Jamie’s recently expanded liquor smuggling business is now threatened and the task at hand leaves Fergus & Young Ian to sell every illegal barrel they’ve got. This greater plot point of trying not to be caught for smuggling, or worse for the treason of supporting a Papist movement, eventually leads to the heart-breaking moment of watching the print shop go up in flames. Which – as an aside – was an absolutely beautiful (and breathtaking) cinematic shot. Kudos to the Outlander crew involved in that stunt! That fire was mesmerizing. Besides attempting to save the man she nearly killed, Claire makes a house visit to the Campbell’s where she treats/diagnoses Margaret. Margaret’s brother has been heavily sedating her for years leaving Margaret in a very catatonic state. Claire’s advice is to stop the sedation and instead prescribes mistletoe tea to help her mental disorder. Seeing Claire immediately return to her role as a healer, and now as a licensed doctor, was brilliant. Having to take 20th century teachings and figure out how to apply them in 1766 with limited access to the tools and medicine she has grown accustom to, we could be entertained by that all day! She’s like the MacGyver of the 18th century. What three items will she pull together next? Look into her eyes and tell her how beautiful she is. Offer her a drink, whatever her heart desires. While I don’t encourage the use of alcohol as a crutch for life, I’m sure this method can be highly effective. Either way, it was adorable to hear Fergus teach it and watch Young Ian then implement it. They say the truth will set you free, and although they spent the majority of last week’s episode catching up on 20 years apart, Jamie still has a secret. A big life-altering secret. The kind of secret that could send Claire packing for Boston. Jamie. Has. A. Wife! And no, we aren’t talking about Claire. Everyone else seems to know about this wife, there’s been murmurings all around, but no word has been spoken to Claire about it. Things are about to get very heated and the longer Jamie waits to tell Claire, the worse it will be. What Will Claire & Jamie Do? Créme De Menthe comes to a nail-biting, heart-pounding end as during Young Ian’s first time with a lady an intruder with a blind eye breaks into the print shop. Young Ian tries to fight him off and instead gets thrown into the loose panel where Jamie has been hiding his treasonous pamphlets. Betraying Sir Percival (a crooked agent of the Crown) is one thing, inciting sedition is another. The intruder shoots at Young Ian near the fire pit, and the shot causes the print shop to erupt in flames. As word spreads through town, Jamie arrives and heroically rescues Young Ian from the flames as we watch the now iconic print shop sign burn. 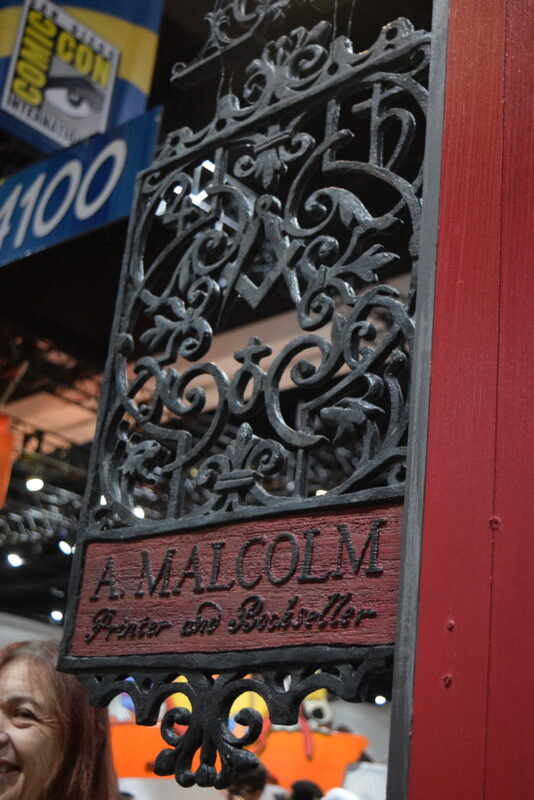 The same sign many of us got to see in person at San Diego Comic Con this past summer (which also appeared at the STARZ pop up activation at The Grove LA held for the Outlander season premiere). Looks like Claire & Jamie are once again back to basics, no property or material possessions to tie them down. Will they rebuild? Move back to Lallybroch? Open a healing practice for Claire? Whether you’ve read the books or not, tweet us what you think Claire & Jamie should do now.